Mountain bike orienteering (MTBO) combines the skills of map reading, route choice decisions and bike riding ability. It can be both a competitive sport as well as an active outdoor recreational activity. Using a detailed, customised map that shows terrain features as well as the road, track and path networks, competitors have to navigate between checkpoints (controls) making route choices on the best (fastest) way. Picking the best route choice that uses the fastest tracks and minimises the amount of climbing involved, is part of the challenge of competitive MTBO along with the ability to handle a bike over varying terrains. To minimise following, competitors are started at least two minutes apart, except for mass start events. As an environmental safeguard, competitors may not leave defined paths and tracks and all controls are placed on obvious features such as track junctions. A variety of courses are offered at all events to suit different levels of fitness and navigational ability - from beginners through to seasoned competitors. There are also social courses available for those new to the sport or for those who want to ride as a group. Ideally, MTBO events require a large area (greater than 40 sq km) with a good variety of tracks of different standards, preferably in terrain which also has a varying topography. Pine plantation areas have proven to be ideal for the sport because their extensive track network provides for route choice options. MTBO events are now conducted throughout South East Queensland as well as occasionally in the Far North of the state. The sport has been steadily developing over the last decade with a regular series of events being conducted each year on the Sunshine Coast, the Granite Belt and in the Crows Nest - Blackbutt area. Around the Brisbane region, there are only a limited number of areas which are suitable for MTBO although Come and Try It events and park events are conducted to introduce newcomers to the sport. Queensland's first dedicated MTBO club, the Multi Terrain Bike Orienteers Club was formed in 2007, to focus specifically on promoting, organising and encouraging participation in mountain bike orienteering events. For information contact Craig Steffens 0418871193 or visit the MTBO club website www.mtbo.com.au. MTBO is well established in all other states and Australian MTBO Championships are now conducted annually on a rotational basis around the country. What do you need for MTBO? A bike with off-road capabilities in good working order. A means of carrying your map on the bike. 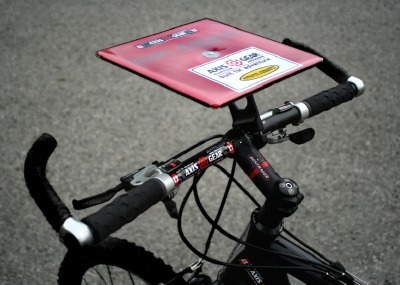 MTBO competitors use a rotating board on their handlebars to attach their map to, so it is easy to read and keep oriented to the surrounding terrain, while they're riding. These can be bought commercially or you can have a go a your own DIY version.